We wanted to start 2019 by examining last year’s projects and looking into some of the emerging trends. We hope our observations will help you to create a contemporary and functional space with all the facilities needed to support your staff. We have noticed an increase in requests from our clients for flexibility in furniture in order to create adaptable rooms. This allows schools to maximise their space and make the most of their budgets. Schools’ needs evolve over time and the demands on a space can quickly change. Designing school science labs that can be adapted easily depending on the lesson plan and students’ learning style is extremely important. 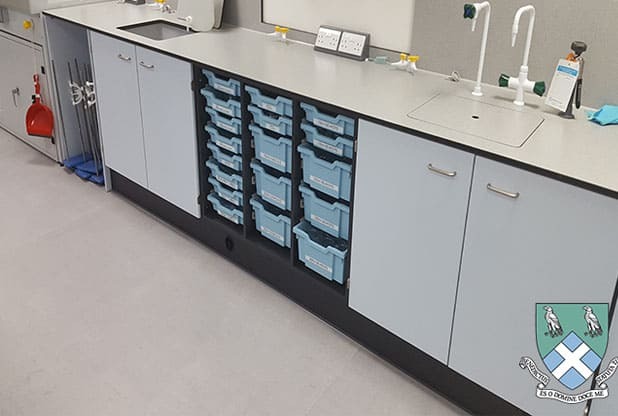 For example, the science labs at Rydale School feature mobile table frames with storage units fitted under. During a theory lesson the students would all face the front, seated at the three static tables. For practical lessons the students can spread out using the worktop above the mobile storage unit. The mobile units can be moved to another location if required, so this design maximises worktop area and available storage space. This is a current interior design trend. We have noticed aspects of this style are being adopted by a few of our clients in educational environments. 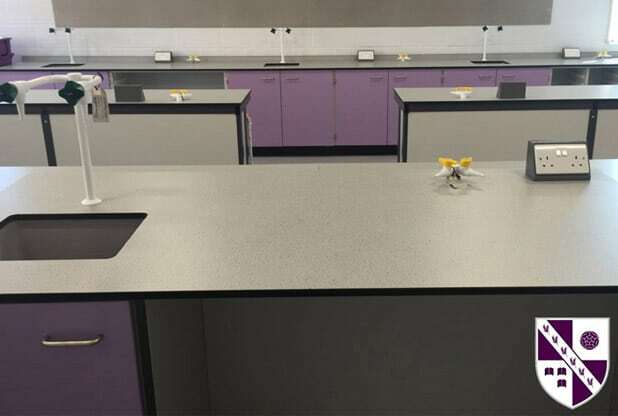 Two recent clients, Tonbridge School, and Co-op Academy Manchester, have chosen to incorporate details of this trend into their science laboratories. Both projects have exposed ceilings and pipework which adds an industrial feel to the interior. It was extremely important that the furniture designed for these spaces complimented the features of the building. 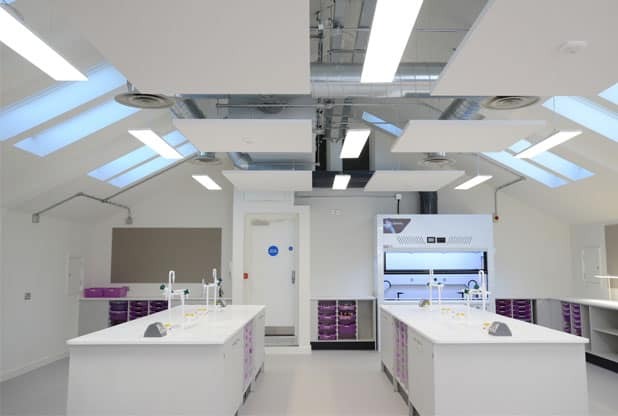 Klick designed and installed science laboratory furniture with clean lines in a neutral colour scheme to coordinate with the industrial architecture. 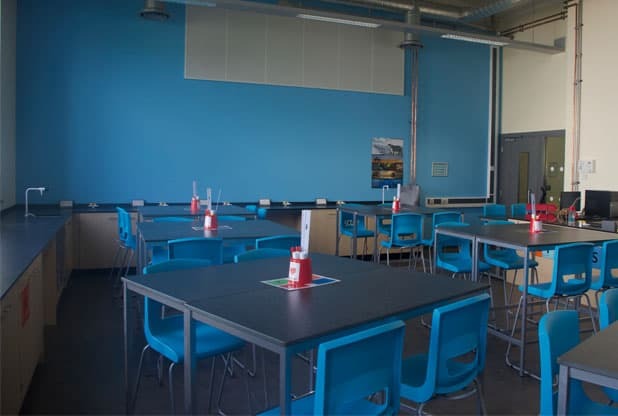 Schools use interior design to reflect their brand ethos, with subtle branding touches such as the use of school colours within the interior environment. This design choice is something many of our clients choose to employ. Colour is a concern for many of our clients, they worry their colour selection will become outdated. Following a school colour scheme adds a sense of heritage and provides purpose to your selection. However, this can be problematic for some clients with school colours that are rather intense for an interior space that will be used on a daily basis. 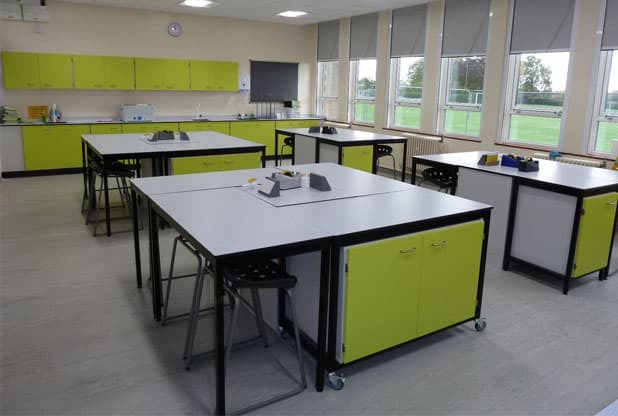 We recommend using these colours as highlights; for example at Tarleton Academy they selected lilac just for the cupboard doors and at Bradfield College they have light blue trays in their science lab. Look out for part two coming soon, where we share more design predictions for 2019. If this blog has inspired you to adapt your own classroom get in touch with us today. We can discuss your project and how we can incorporate these trends into your space. To book your free design consultation with one of our experts please email us at sales@klicktechnology.co.uk or call us on 0161 998 9726.